Could an Answer to the US-Canadian Lumber Trade War Soon be Here? Could an Answer to the Multiyear US-Canadian Lumber Trade War Soon be Here? Spend Matters welcomes this guest post from Verity Michie, market analyst at Mintec. Following the expiration of the nine-year-long softwood lumber agreement (SLA) in October 2015, the U.S. and Canada have yet to finalize a new trade agreement. But why do they need one? Canada has been exporting lumber to the U.S. since the 1800s and trade tariffs have been imposed since the 1930s. Most of Canada’s lumber is government owned, which gives Canadian exporters a competitive edge over U.S. lumber producers, as they benefit from low stumpage fees (harvest prices). The majority of U.S. lumber is privately owned, meaning stumpage fees are competitive and not fixed. The 2006 U.S.-Canada SLA was put in place after claims that Canadian lumber was unfairly subsidized, allowing cheap imports to flood the U.S. market, reducing the U.S. market share. As Canada is a major exporter of lumber to the U.S., the U.S. still relies on Canada to meet domestic consumption. Therefore, the two countries came to an agreement that put duties or quota limitations on Canadian lumber exported to the U.S. Between 2001 and 2006, the U.S. share of the lumber market averaged 63% and Canada’s averaged 33%, whereas in 2011 the U.S. market share rose to an average of 71%. This shows the successful result of the SLA. In November 2016, the U.S. submitted a petition to impose a new trade deal with Canada, known as Lumber V. Between January and April 2017, U.S. lumber prices rose 17% in anticipation of this new trade agreement, peaking at four-year highs. Eighteen months after the expiration, in April 2017, U.S. President Donald Trump announced re-imposing an export tariff of up to 24% on softwood lumber from Canada, following from the petition in November. A new trade deal is expected to be finalized by September 2017, so we still have to wait to see how these almost century long U.S.-Canada lumber disputes play out. I am somewhat shocked at your article. It seems that you have researched most information reasonbly well, However, you have perpetuated some very important assumptions. a] Canada’s stumpage rates are NOT traditionally lower than the USA, they are simply determined on a differing scale, one which the US insists we abandon in favour of the “Scribner scale” which is utilized in the USA. In fact, when our two log markets are rationalized on the same playing field, utilizing the same criteria, British Columbia’s average log values are much higher than the counterparts in the US. 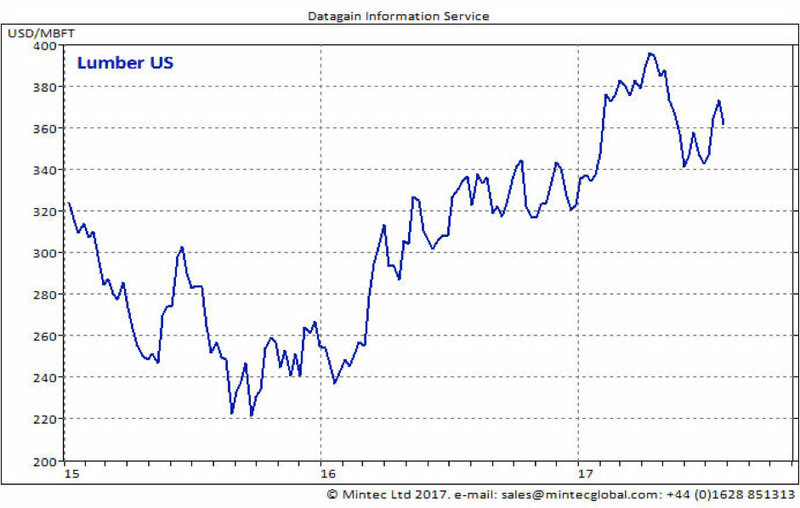 c] the 2011 US share of 71% is far more reflective of the parity in US$ to Cdn$ than anything effectiveness of the SLA, as soon as the exchange went back to 85 cents ( US41=Cdn$1.18) surprisingly, the US lumber market picked back up. Not that it was exclusively due to the exchange rate, but it is a heavy factor in cross border trade. We here in Canada fully anticipate prevailing, yet again ( this will be the 5th time it has gone to international courts since the 1930’s, Canada winning the four previous times) and we are fiully anticipating the US refusing to remove the trade barriers completely. Thus, we shall yet again be forced to knuckle under to the American show of strength, and agree to a “deal” ……. but do not for one moment think that the Canadians are happy about it, nor should the American people be either, since all it does it add an extra “tax” on the price of your home.